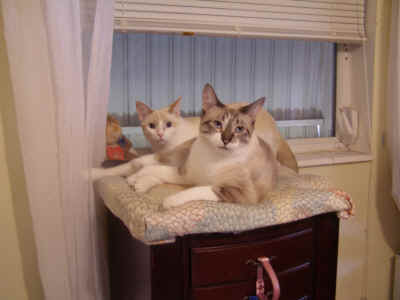 Clarence and Dorothy are Siamese cats who live in a little pink cottage in the center of town. Behind their back yard is a twelve foot wide canal that winds through the village, and flows into The lagoon. Clarence was born in an overgrown vacant lot, and now that he has an indoor home he likes to stay in it, often under the bed. Of course he has to go to his night watchman job five days a week at 10:00 PM, but in the daytime he ventures from under the bed to eat, watch tv, use the litter box, sharpen his claws, play with his toys and xbox, and keep watch over the neighborhood from thecottage windows. Dorothy was born a fancy cat, a social butterfly, in a beautiful big house. One day, as a half-grown kitten, she ran out the door to meet the doves at the hedge, and got lost scampering after them into the nearby woods. Dorothy found Clarenceâ€™s colony and was happily accepted by the elders. Mr. Turtlety lived in the canal. One spring morning he awoke, poked out his head to greet the peppermint stick colored sky, and extended his arms and legs. â€œOh no, help me, Iâ€™m sinking in some awful gunk!â€�, cried the little turtle to his soaring-by friends Brian Bluejay and Kenny Catbird. â€œHoly moley, it IS mudâ€�, thought Mr. Turtlety, as he realized he was not sinking, just stuck. It was a struggle for two birds and a cat to push and pull a turtle up on the grassy bank. 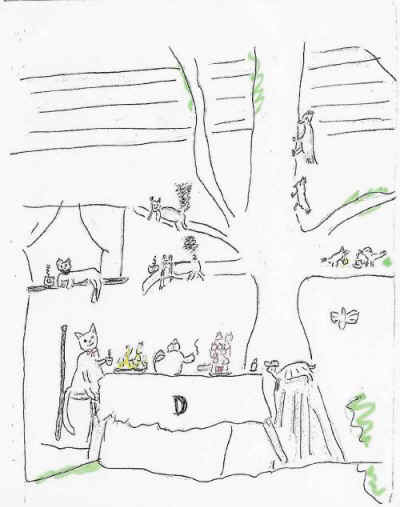 Dorothy, a caring and clever cat, decided to have a catnip tea party at her place to discuss how the neighborhood could help Mr. Turtlety with his predicament. had the most heavenly aroma, hinting of orange blossoms and meadow honey. Clarence guardedly watched from the window. Finally, it was the 2 Oâ€™clock meeting time, and all were seated or perched. Mrs. Wooddebby and her children, Jay and Riley, noticed the festivity while pecking for insects high up in the squirrel tree, and came down to investigate. â€œPlease join usâ€�, said Susan Squirrel. â€œItâ€™s not a party until the Woodpeckers get hereâ€�, said Sharon Squirrel. As the guest of honor, he lounged on a tree stump at the head of the table. All the guests thought and thought. In fact, so much eating and so much thinking resulted in much napping. Clarence alone stayed awake. 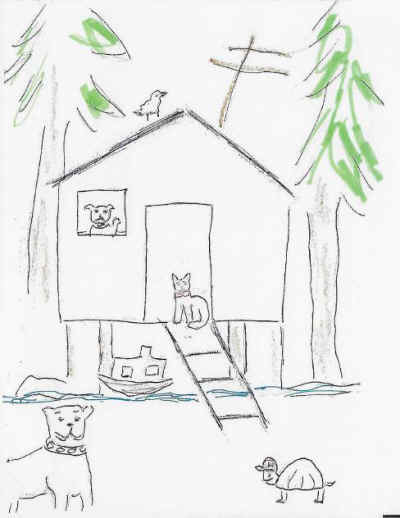 He noticed Larry and Chase, the pit bull boys from across the canal, tiptoe over the mud, slink through the garden and crawl over the lawn to the tea table. Brian and Kenny swooped down, â€œRat a tat tat, brroom, swooshâ€�, while dive-bombing the dogs. Dorothy climbed into the window where Clarence had been, and the party was over. The dogs tried to explain why they were there. â€œWe are seldom invited to fun things, and decided to come over while everyone was dozing. While we were crawling over, we heard parts of the discussion about Mr. Turtletyâ€™s problem.â€� said Larry. Dorothy, peeking over the window sill, now felt bad for Larry and Chase and jumped down to offer them leftover treats (and tea). â€œHow bigoted of us to always exclude you just because you are pits.â€� The dogs, glad to be included in anything, were eager to share their idea. Mr. Turtlety poked his head out of his shell, â€œHi fellasâ€�, and listened cautiously. As all of them walked or flew over the back yard and mucky canal. A cozy little doghouse loomed ahead amongst the tall, whispery Australian pine trees. Mr. Turtlety said, â€œThank you Larry, thank you Chase.â€� He was happy he could have a new home under such a pleasant home. His friends all agreed it was a good plan and were relieved that the thinking was over! â€œMore good neighbors to invite,â€� thought Dorothy. When she got back to the cottage and told Clarence, a cat of few words, what had been decided, he remarked, â€œLess intruders to worry aboutâ€�. He watched guard over Dorothy cleaning up after the party as he finished watching Walking Catastrophy.